Domestic Shorthairs have short, sleek fur. They come in every color seen in cats, as well as just about every pattern, including tortoiseshell, mackerel tabby and solid. Domestic Shorthairs can have different body types and facial expressions, depending on the more prominent breeds in an individual cat’s ancestry. Their weight can vary, from 11 to 22 pounds. Males tend to be larger than females. Domestic Shorthairs are of mixed ancestry, so their temperaments can be hard to predict. Some cats are quiet and docile while others are more active and vocal. Some are affectionate, while others are independent. Most are playful when they are young. Some enjoy the company of children and other pets. All Domestic Shorthairs have one thing in common: their short, sleek coat. Owners of this type of cat don’t need to spend too much time grooming their pets. An occasional brushing is all that’s needed to remove loose hair. Domestic Shorthairs are not purebred cats, but are of mixed ancestry. Domestic Shorthairs need only occasional brushing to remove loose hair. Domestic Shorthairs can vary greatly in temperament because of their mixed breeding. 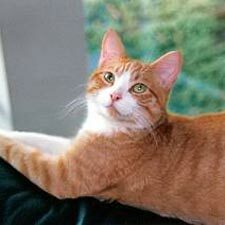 The Domestic Shorthair is the result of many generations of mixed breeding with different types of cats. In the U.S., cats first came over with the Pilgrims. Some of these cats went on to be the foundation for pure breeds like the American Shorthair, while others bred to cats brought to America from foreign countries. Domestic Shorthairs are closely related to Domestic Longhairs and Domestic Medium Hairs. The primary difference is the dominant short-coat gene inherited by the Domestic Shorthair, which produces its sleek coat. A Domestic Shorthair can produce a Domestic Longhair, and vice versa.